The potential of Axl as an oncology target is now widely accepted and BerGenBio’s BGB324 is a first-in-class selective oral Axl inhibitor in clinical development. Data shows that BGB324 can reduce resistance to targeted and chemotherapies. However, it is now recognised that BGB324’s greatest prospects could be as an immuno-oncology agent that acts both on tumour and immune cells. 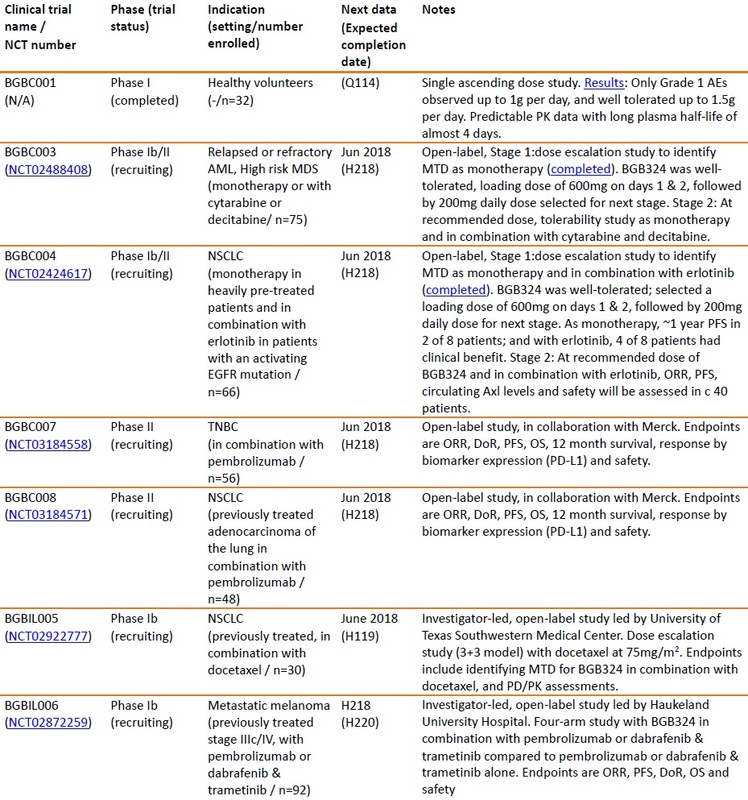 There are currently six Phase II studies ongoing, with three in immuno-oncology settings, and regular data read-outs are due over the coming year. We value BerGenBio at NOK1,564m ($184m), or NOK31.34/share. BerGenBio is leading the Axl field BerGenBio leads the understanding of Axl biology and its lead programme, BGB324 is the most advanced selective oral Axl inhibitor in development. A key role of Axl in cancer is to promote epithelial-mesenchymal transition (EMT), which is linked to metastasis and drug resistance. Recently the broad ranging immune suppressive effects of Axl signalling in cancer have gained prominence. BerGenBio is developing a portfolio of therapies and targeting Axl. Axl inhibition promises to transform immuno-oncology Through a combination of direct and indirect effects, the inhibition of Axl has the potential to significantly enhance the activity of immuno-oncology therapies. Within a tumour, Axl signalling has been shown to enable tumour cells to both resist immune cell mediated killing and to support an immune-suppressive tumour microenvironment. Axl inhibition not only reverses these effects but also increases the anti-tumour activity of many immune cells, including cytotoxic T-cells. 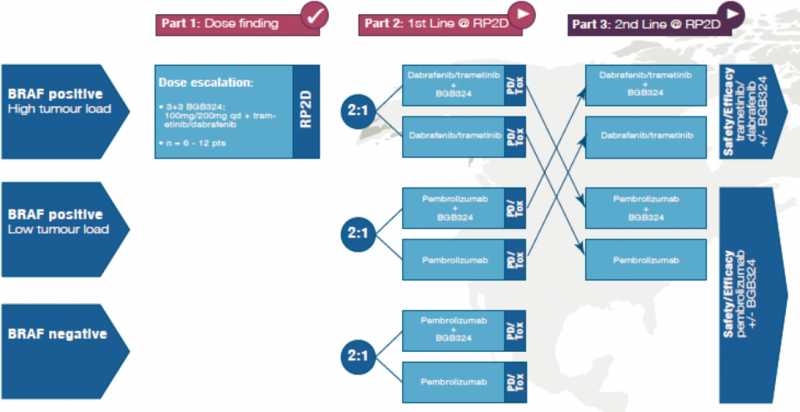 Six Phase II clinical studies underway To understand better BGB324’s potential, BerGenBio has a broad Phase II programme, with an emphasis on immuno-oncology. Three of the six trials are in combination with Merck’s pembrolizumab (Keytruda) in melanoma, lung and breast cancer. 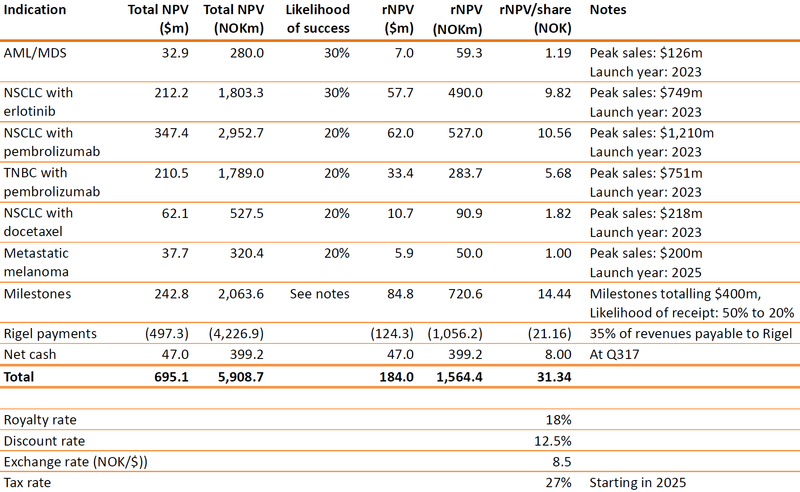 Data from all of the trials is expected throughout 2018.
rNPV model suggests a valuation of NOK31.34/share We prudently value BerGenBio using a rNPV model based only on the indications/settings in which BGB324 is currently being assessed. This gives a value of NOK1,564m ($184m), or NOK31.34/share, with significant upside from positive clinical data. BerGenBio had NOK399m in cash at Q317, which should allow it to operate into H119 and deliver data from the current clinical trials. BerGenBio is a clinical stage biotechnology company that is focussed on exploiting its knowledge of the Axl signalling pathway as a drug target. It was founded in 2007 by Prof James Lorens of the University of Bergen, Norway. His pioneering work in understanding the role and biology of Axl is being explored in oncology indications, with early clinical results showing encouraging activity. The lead compound, BGB324, is undergoing “proof of concept” Phase II trials as both a single agent and in combination therapy. Following an IPO in April 2017, raising NOK400m ($47m) gross, BerGenBio is listed on the Oslo Exchange. The company consists of 35 people, with research facilities in Bergen and the clinical development functions in Oxford, UK. BerGenBio is a classic biotechnology company and is well suited to valuing using an rNPV model. Using conservative assumptions throughout, we have ascribed a risk-adjusted value to BGB324 in each indication, summed them and netted against projected costs. Although BGB324 has clear commercial potential in many other indications, we have attributed no value to those indications or to the pre-clinical programmes. These latter assets are expected to progress into the clinical stages in the near term and represent additional upside. Despite our prudent approach, we value BerGenBio at NOK1,564m ($184m) or NOK31.34 per share, which is 47% above the current share price. There are multiple catalysts to drive further upside over the next 15 months, as data from the six open-label Phase II trials are expected to report regular data. BerGenBio had NOK399m at Q317, sufficient cash to operate into H119, after raising NOK400m (gross) at NOK25/share during the IPO. Before then, the company should report final ORR data from four clinical trials (acute myeloid leukaemia [AML], non-small cell lung cancer [NSCLC] with erlotinib and with pembrolizumab, and triple-negative breast cancer [TNBC] with pembrolizumab), and interim data from the two other trials. The typical industry risks associated with clinical trials, regulatory hurdles, financing, possible partnering discussions, and eventually pricing and commercialisation apply. Currently, the main sensitivity relates to the novelty of the Axl protein as a therapeutic target. Successful clinical outcomes would clearly position BerGenBio at the forefront of an exciting, and lucrative, area; however, inevitably such innovation carries a higher risk profile. 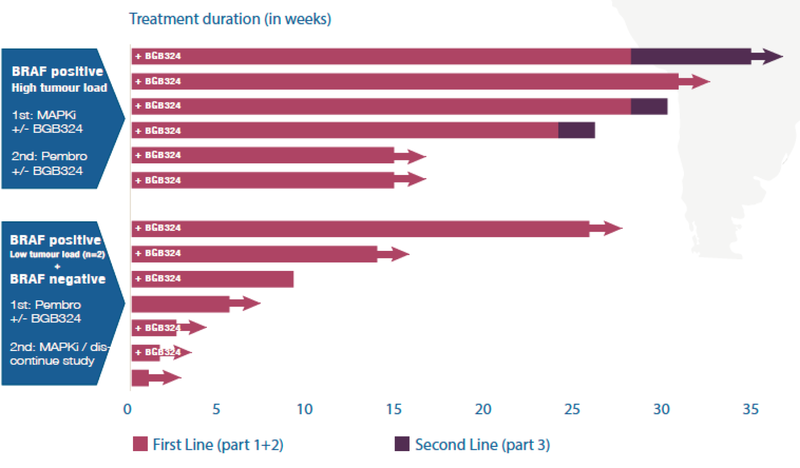 The key near-term inflection points are the results of various oncology trials currently underway with BGB324. If successful, the next sensitivity would be whether management opts to license the programme out or look to assume a degree of self-commercialisation; at this stage, we expect they will seek a partner. BerGenBio’s lead compound, BGB324, is being tested in six Phase II trials in various cancers and a broad range of settings, including in combination with immuno-oncology therapy. This programme highlights the considerable potential of BGB324 as an oncology therapy. The compound is also the first-in-class selective oral Axl inhibitor in clinical development, just as the understanding around Axl’s biology confirms it is a highly promising oncology drug target. Final ORR data from four of the ongoing trials are due to be reported by the end of 2018, as well as interim data from all of the studies in H118. Our rNPV model gives a valuation of NOK1,564m (NOK31.34 per share), which could rise materially with positive results from the trials. BerGenBio was founded to commercialise the research of Prof James Lorens (University of Bergen, Norway) to develop drugs that disrupt endothelial-mesenchymal transition (EMT), and in particular inhibit the Axl receptor. Since then, knowledge of Axl’s biology has grown (especially in the field of immunology), and its link with aggressive tumours strengthened. Axl is a tyrosine kinase receptor, which can activate EMT, cell migration, proliferation, survival, and immune suppression pathways. The actual effect of activating the Axl receptor is dependent on the cell type and physiological context. Axl is broadly associated with advanced malignancy, inflammation and EMT, which allows tumour cells to adapt and change their characteristics. This engenders resistance to chemotherapy and targeted therapies, and promotes metastasis. Of particular importance is that Axl enables tumour cells to escape immune destruction and modulates the activity of immune cells. This is raising considerable interest in the field of immuno-oncology. The potential of Axl as a drug target led BerGenBio to in-license BGB324 from Rigel Pharmaceuticals in 2011. Clinical development started in 2013 and this compound is still the only selective oral Axl inhibitor in clinical development. The Phase I study, in healthy volunteers, confirmed that BGB324 was well tolerated. BerGenBio is now conducting an extensive Phase I/II trial programme in AML as monotherapy, NSCLC with erlotinib, TNBC with pembrolizumab, NSCLC with pembrolizumab. There are also two investigator-led trials underway, in NSCLC with docetaxel and in metastatic melanoma with targeted and immuno-oncology therapies. There is already promising initial data from the AML, NSCLC/erlotinib and NSCLC/docetaxel trials. Final ORR data is expected in H218 from the AML, NSCLC/erlotinib, NSCLC/pembrolizumab and TNBC/pembrolizumab trials (the company has a cash runway into H119). BerGenBio is undecided on whether to advance BGB324 into Phase III by itself. However, if the data from the current Phase II studies confirm the broad potential of BGB324 to prevent resistance to chemotherapy and targeted therapies, and enhance the activity of immuno-oncology, we would expect the company to partner the asset on attractive terms. The Axl receptor was first identified from a screen of genes associated with chronic myeloid leukaemia in 1988, but it is only recently that its potential as a drug target is being realised. Activation of Axl signalling has far reaching effects on the immune system, the tumour microenvironment, and tumour cells themselves. With the deeper understanding of Axl biology, it is becoming clear that Axl inhibitors have considerable therapeutic potential in combination with immuno-oncology therapies, as well as in overcoming resistance to chemotherapy and targeted treatments. Part of the reason for the delayed recognition in Axl as a drug target in cancer, even though it is a tyrosine kinase receptor (RTK), is that it has a limited impact on proliferation. At the same time, the important role of the immune system in combatting tumours is now better understood, as is the process of epithelial to mesenchymal transition (EMT) in enabling tumours develop drug resistance, evade the immune system and metastasise. Axl is a member of the TAM family of tyrosine kinase receptors together with Mer and Tyro-3. The sole ligand for Axl is GAS6, which causes receptor dimerisation, thereby triggering downstream signal transduction. TAM receptors are important regulators of the innate immune system and macrophage phagocytosis. Axl expression is in part distinguished from other TAMs by its close association with inflammation and prevalence in malignancy. Axl is present at low levels in adult tissues and it appears to have limited function; indeed, Axl knockout mice are normal. In contrast, it is commonly expressed at high levels in many cancers and associated with a worse prognosis for those patients (Exhibits 1 and 2). Interestingly, few activating mutations (typical of RTKs) have been identified, suggesting that epigenetic regulation of Axl is important. The pathway that activates Snail and Twist, which leads to EMT. During an immune response, the STAT1 pathway is activated in macrophages and dendritic cells by the cytokine IFN-γ binding to the IFN receptor. This is crucial in stimulating an innate response to an infection, but to prevent an excessive immune response, there is also a ‘safety switch’ triggered by the increased expression of Axl. This results in the activation of SOCS3 genes that down regulate pro-inflammatory cytokines and dampen the immune response. 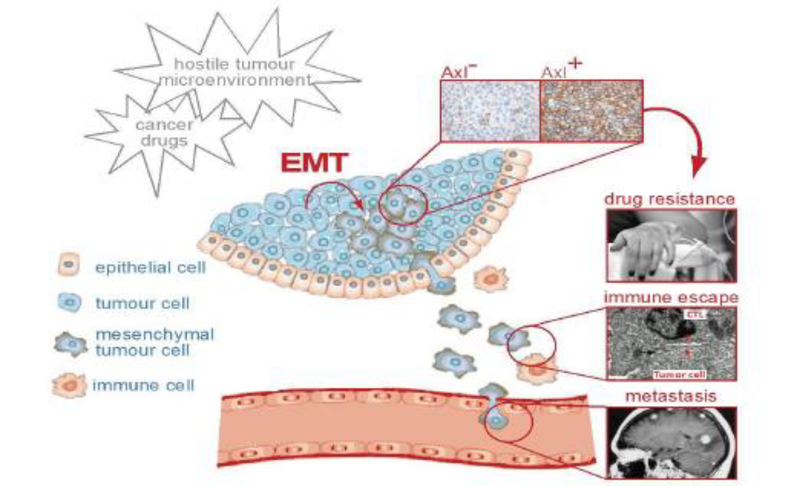 Within a solid tumour, Axl regulates the EMT of cells. The transition of tumour cells from an epithelial to mesenchymal-like cell type supports strong invasive characteristics. EMT also causes tumour cell secretion of anti-inflammatory cytokines that suppress anti-tumour immunity. This is characteristic of “cold” tumours with limited invasion of cytotoxic T cells. During EMT, the expression of hundreds of genes change enabling the acquisition of new cellular behaviours. This allows tumour cells to break away, invade the surrounding tissue and vasculature, and access sites in other organs. This plasticity further allows distant colonisation and the formation of secondary tumours (metastasis). These phenotypic changes are closely associated with reduced sensitivity to chemotherapy or targeted oncology drugs. In fact, one of the reasons that cancers stop responding to treatment is that therapy-induced stress triggers EMT. This insight has raised interest in targeting this mechanism. Associated with the EMT of tumour cells, there are also changes that can enable tumour cells to escape immune surveillance. Firstly, there is reduced expression of MHCI proteins (Major Histocompatibility Class I protein) the proteins that present protein fragments to cytotoxic T-cells. Secondly, the EMT cells express higher levels of PD-L1, which inhibits the activity of cytotoxic T-cells. In preclinical studies with radiation sensitive and resistant tumour cell lines, Axl inhibition was shown to have a greater effect on restoring radiation sensitivity than the use of checkpoint inhibitors and was found to increase infiltration by cytotoxic T-cells. Axl can also promote tumour progression through angiogenesis. The receptor is needed for VEGF-A-induced migration of endothelial cells and the formation of new blood vessels in tumours. Axl has also been linked to dormancy of metastatic prostate cancer cells in the bone marrow, and cancer stem cell activity in recurrent breast cancer. 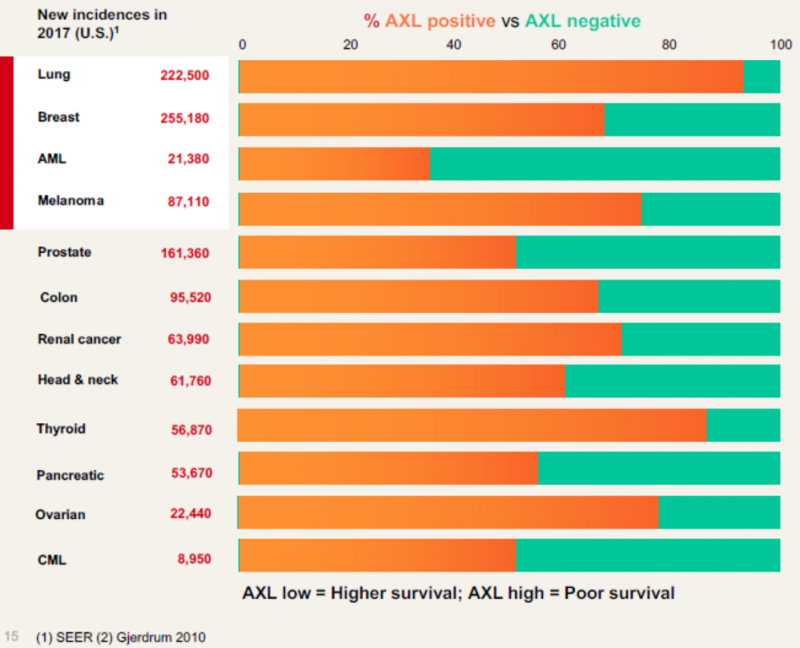 Interest in Axl as a therapeutic target for cancer and other therapeutic areas (eg auto-immune diseases) has only recently grown, fuelled by its potential in immuno-oncology. BerGenBio’s BGB324 is the first-in-class selective small-molecule Axl inhibitor in clinical development that can address this opportunity. The company’s leading position is thanks to the prescient in-licensing of the compound (R428) from the San Francisco-based biotech, Rigel Pharmaceuticals (discussed below). Exhibit 5 details other compounds in development that inhibit Axl; the only other compound in clinical development with reasonable specificity is Daiichi Sankyo’s DS-1205, but it appears that it is being developed for use in combination with osimertinib (Tagrisso) in mEGFR NSCLC. The other molecules with some degree of specificity for Axl are Ono Pharmaceutical’s ONO-7475 (which binds to the other TAM protein, Mer) and Betta Pharmaceuticals’ BPI-9016M, all of which are in Phase I development. The specificity of BGB324 is important, as it means that it should be easier to combine this compound with other drugs, compared to those with more promiscuous inhibition profiles. The biology of Axl also indicates that combination of the compound with other agents could result in successful therapies for many tumours. Initial data on BGB324 supports the view that it can be used in combination with various drug classes; BerGenBio has shown that BGB324 can be combined with erlotinib (see below). In contrast, a trial with Astellas’s gilteritinib with erlotinib in NSCLC had to be terminated after the treatment of only 10 patients because of adverse events. 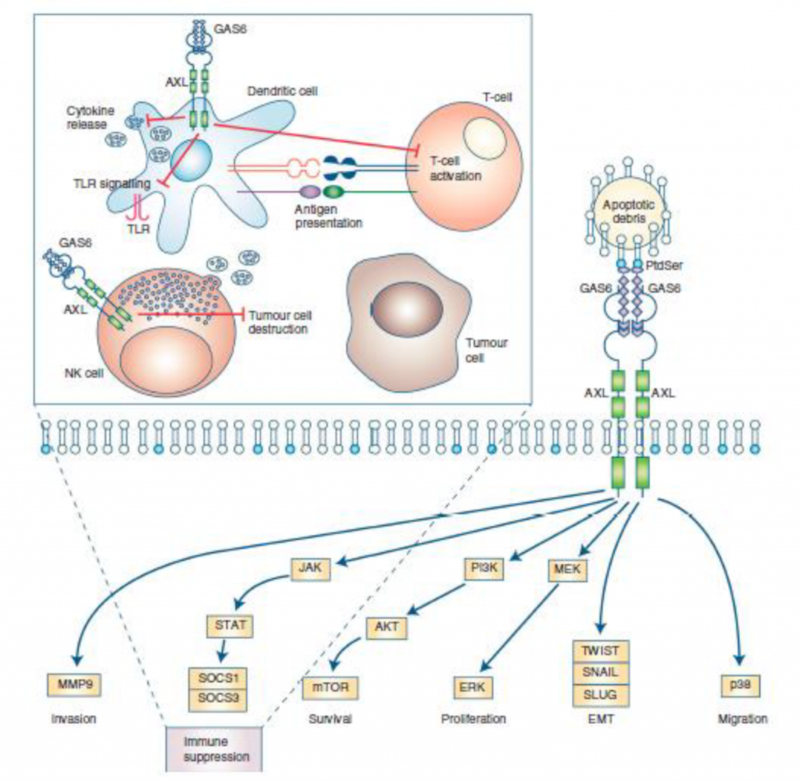 The Axl receptor is also being targeted using monoclonal antibodies and antibody-drug-conjugates (ADC). Indeed, BerGenBio has two such preclinical assets in its portfolio with BGB149, an antibody, and BGB601, an ADC. Other companies have reported preclinical antibodies (eg Genentech’s YW327.6S2), while the most advanced antibody-based product in clinical development is Genmab’s ADC, Humax-AXL-ADC. It is unclear at this stage which Axl targeting approach is the most effective, and it is possible that this will depend on the indication. However, the favourable manufacturing and convenience of an oral small molecule inhibitor for patients are important strengths of BGB324. Exhibit 6 provides details of BerGenBio’s entire pipeline. 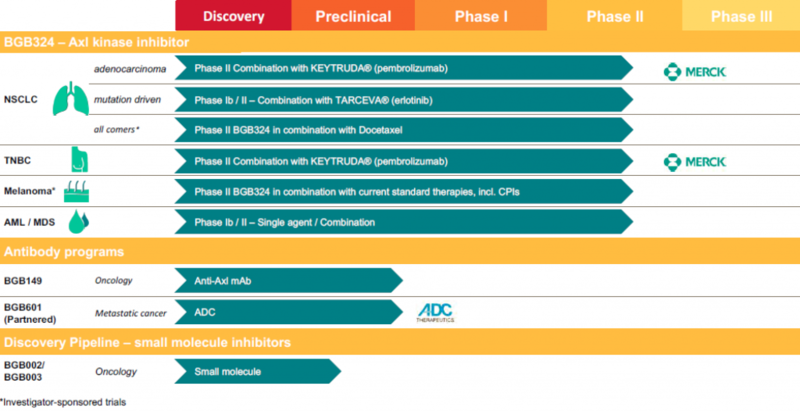 As well as BGB324, the company has two monoclonal antibodies against Axl in development; BGB149, due to enter the clinic in H218, and BGB601, which is an ADC partnered with ADC Therapeutics. These are also being developed in cancer indications, but no details have been disclosed; they might have potential in other therapeutic areas given the activity of Axl in other diseases. The rest of this report is focused on BGB324 as it is currently BerGenBio’s only clinical asset. The clinical development of BGB324 began with a Phase I study in healthy volunteers in 2013/14, unusually for an oncology compound. This was possible because of the clean safety profile shown during preclinical development. The data from the Phase I study confirmed this favourable safety profile, with it being safe and well-tolerated up to a dose of 1.5g per day and only grade 1 reversible adverse events were observed up to 1.0g per day. Since then BerGenBio has embarked on a broad clinical trial programme in a range of cancer indications and different drug combinations (Exhibit 7). The focus of the studies is moving towards exploring BGB324’s potential as an immuno-oncology agent, as the ability of Axl inhibition to enhance anti-tumour T-cell activity is better understood. While it is unusual for a small biotech company to embark on such wide-ranging clinical trials, it is rational and means that it will be in the best position to maximise the value of the compound. The company has also selected indications in which a high expression of Axl is associated with a poor prognosis (Exhibit 3). The approach, firstly, helps to mitigate the risks associated with developing a compound against a novel target with such complex biology, which is only starting to be better understood. Secondly, the data from the trials in different settings (monotherapy, with an immuno-oncology drug, to alleviate drug resistance) will help to indicate where BGB324 has most potential. BerGenBio is also looking to reduce the risk profile of BGB324 development, by including biomarker analysis in its clinical development plan. The aim is to develop a companion diagnostic to identify patients most likely to benefit from BGB324 treatment. Among the potential biomarkers being analysed are: tumour Axl expression, soluble Axl in the blood, and known immune and EMT biomarkers (protein and genomic). We estimate that BGB324 could advance into Phase III in 2019, assuming promising levels of efficacy are observed during the current studies. The pivotal studies could in turn lead to a NDA in the US and MAA in Europe being filed in 2021/22 and BGB324 being approved in 2022/23. BerGenBio’s first Phase II study is in relapsed/refractory acute myeloid leukaemia (AML) and high-risk MDS patients (c 30% of MDS patients will end up developing AML), indications that mainly affect people over the age of 45 (average age for AML: 67). Until recently there has been limited innovation in therapy, which has essentially only seen modest variations on the 7+3 chemotherapy regimen of cytarabine and daunorubicin. The treatment landscape is starting to evolve with the approval of Novartis’ midostaurin (Rydapt), Agios/Celgene’s enasidenib (Idhifa) and Pfizer’s gemtuzumab ozogamicin (Mylotarg) in 2017, but there is still much demand for a treatment suitable to treat elderly patients with AML or MDS in these highly heterogeneous indications. High Axl expression is associated with a poor prognosis for AML patients and Axl signalling drives proliferation, survival and chemo-resistance of AML cells, making Axl an attractive target in AML and closely-related MDS. The potential of BGB324 to treat AML and MDS was subsequently confirmed in preclinical studies, in which BGB324 was shown to inhibit the Akt and MAPK pathways, have a similar or greater affect than cytarabine, and have an additive anti-tumour effect with cytarabine in two different AML cell lines. BGB324 is now in a Phase Ib/II study in AML, started in 2014. The first part of the study was the dose escalation stage with the following three dosing regimens: a loading dose of 400mg for two days followed by a daily dose of 100mg; 600mg then 200mg; and 900mg followed by 300mg. The most common side effects were reversible mild and moderate gastrointestinal disorders (there was in the lowest dosing cohort one dose-limiting toxicity [DLT], QTc prolongation, but this was associated with a pre-existing condition). Based on these findings, combined with the PK/PD data, the 600/200mg dosing regimen was taken forward into the second stage of the trial. There were also promising signals of anti-tumour activity (Exhibit 8) in the pre-treated group of patients (average number of treatments =2). 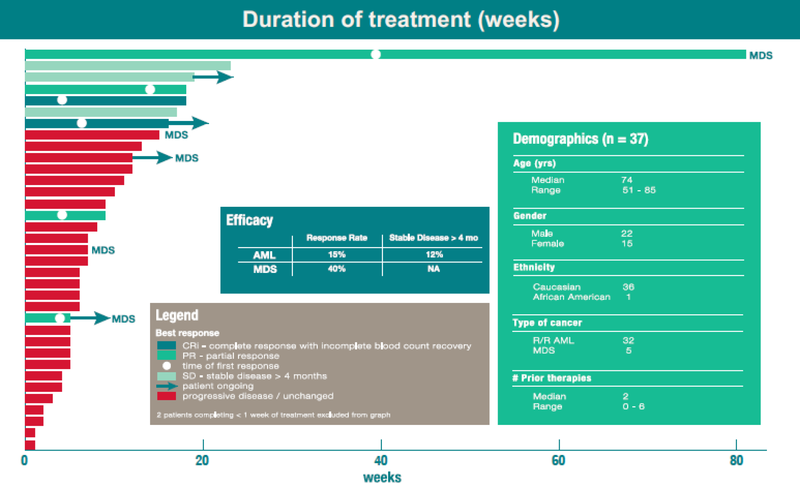 Encouragingly, two (40%) of the five MDS patients achieved partial responses (PR); and four (13%) of the 20 AML patients attained objective responses, including one immunophenotypic complete response (iCR). The company also observed that there were rapid changes in the signalling pathways downstream of Axl, and interesting pro-differentiation effects on the leukaemic cells. Assuming the data from this trial continues to impress (final data expected in H218), we would expect the product to advance into Phase III development. There is a clear need for well tolerated drugs in AML and high-risk MDS. It will, however, be important for BerGenBio to identify which subgroup of AML patients are likely to benefit most from BGB324 therapy. After limited innovation over the last 15 years, in 2017 the FDA approved Novartis’s midostaurin (Rydapt) for FLT3-mutation-positive AML, Agios/Celgene’s enasidenib (Idhifa) for IDH2-mutation-positive AML, and Pfizer’s gemtuzumab ozogamicin (Mylotarg) for CD33-positive AML. Fortunately, BerGenBio had the foresight to include a detailed biomarker programme within the current Phase I/II study to identify those patients most likely to respond to BGB324. AML is a heterogenous disease, and gradually treatment options are improving as the underlying molecular drivers of the disease are better understood. A specific companion diagnostic would also potentially protect BGB324 from competition from Astellas’s gilteritinib, which is in Phase III development for FLT3-mutation-positive AML and Phase I in first-line AML, is very well tolerated by patients, and is a potent inhibitor of FLT3 and Axl. We estimate that BGB324 could generate peak sales of $126m in AML and high-risk MDS, which is based on 5% penetration of the US and European markets. In the US, the American Cancer Society (ACS) estimates that there are 21,380 new cases of AML per annum and 13,000 new cases of MDS. We note that there is considerable divergence of opinion on the true incidence rate of MDS, the ACS estimate that it is 4.8 per 100,000, but other groups believe is could be as high as 13.1. We have used the ACS’s estimate. In the case of AML, we have also adjusted for the cases which are FLT3-mutation positive (c 30%). We estimate that the average cost of a course of treatment in all indications will be $80,000 in the US, with a 33% discount in Europe. It is particularly challenging to estimate the potential pricing of BGB324, should it get to market, because of the broad number of indications and settings in which it could be used. Patients with EGFR mutation (mEGFR) positive NSCLC (c 30% of cases) are often treated with Roche’s erlotinib (Tarceva), but their cancers in most cases normally will recur after 12 months. There are various reasons for the progression. In half of the cases it is due to additional mutations, either in the EGFR protein (eg T790M for which AstraZeneca developed osimertinib, Tagrisso) or in other genes (eg c-Met). Another escape mechanism is EMT via increased Axl signalling, and it is also known that EGFR and Axl interact in a positive feedback loop. BerGenBio has confirmed the potential of BGB324 to treat patients that have developed erlotinib-resistant NSCLC in preclinical studies (Exhibit 9). The company is now conducting a Phase I/II to explore further the ability to treat patients with mEGFR NSCLC that are erlotinib-resistant. The first part of the Phase Ib/II study that was started in 2015 has been completed, and, as in the case of the AML study, the trial has already delivered promising results. The Phase Ib involved dose escalation of BGB324 in heavily-pre-treated, metastatic, second-line mEGFR patients as monotherapy (n=8) and in combination with the standard dose of erlotinib (n=8). BGB324 was found to be well tolerated in both settings up to 600mg loading dose on days one and two, followed by a daily dose of 200mg per day. There were also initial signs of anti-tumour activity as monotherapy and in combination with erlotinib (Exhibit 10). In the monotherapy setting, in patients with or without EGFR mutations, two of the eight people had a PFS of over 40 weeks. In the combination arm with BGB324 and erlotinib in patients resistant to erlotinib, four of the eight patients had a PFS of over four months, with one of them still with a stable disease after 88 weeks. During the second part of the trial, 50 additional patients, with known activating EGFR mutations and erlotinib-resistant tumours, will be treated with BGB324 in combination with erlotinib. Interim data from that stage are expected to be reported at ASCO in June 2018, with the trial being completed at the end of H218. There are an estimated 184,000 new cases of NSCLC per year in the US and 255,000 patients in Europe, of these 70% are classed as having Stage III or IV cancer and c 30% of these cases are mEGFR positive. We estimate that BGB324 could be used to treat 15% of mEGFR patients in the US and 10% in Europe. This suggests that BGB324 could achieve peak sales of $749m in this setting, with peak sales being achieved over six years. Immuno-oncology and, in particular, checkpoint inhibitors are transforming the treatment of many cancer patients, converting the disease into a chronic indication in some cases. However, it has proved challenging to increase the proportion of patients that might benefit from the therapy above 30% in most immunogenic cancers. Given the potential of Axl inhibition to make “cold” tumours “hot” and increase T-cell activity, Merck and BerGenBio have formed a collaboration to investigate the potential of combining pembrolizumab (Keytruda) and BGB324 in adenocarcinoma NSCLC tumours and triple negative breast cancer (TNBC). The belief is that BGB324 will overcome a tumour’s resistance to a PD1 checkpoint inhibitor. Pembrolizumab has so far been approved for use in melanoma, NSCLC, head and neck squamous cell carcinoma (HNSCC), classical Hodgkin lymphoma (cHL), urothelial carcinoma, and microsatellite instability-high cancer (MSI-H). Despite the broad label, there is still a strong belief that the drug could be used more broadly if it was combined with the correct agents. For example, pembrolizumab is only approved in NSCLC as a monotherapy in patients that have tumours with high levels of PD-L1 expression in over 50% of the cancer (otherwise it must be used in combination with chemotherapy). Similarly, initial data from the KEYNOTE-086 study in TNBC shows that some patients did develop durable responses from monotherapy; however, the overall response rate was only 5% regardless of PD-L1 expression. Preclinical studies by different groups have confirmed that BGB324 can act synergistically with PD1/PD-L1 antibodies in targeting established tumours (Exhibit 11). The beneficial effect of the two therapies in combination was associated with higher levels of tumour infiltration by cytotoxic T lymphocytes, natural killer cells and natural killer T cells, and lower levels of monocytic myeloid derived suppressor cells (mMDSC, associated with immune suppression and EMT). Recent studies document that BGB324 treatment inhibits key immune suppressive arginase-expressing tumour associated macrophages and increases dendritic cell populations that promote long term anti-tumour immunity. These changes are all consistent with increased immune activity against the tumours. We estimate that BGB324 could generate peak sales of $1,210m and $751m from use in combination with pembrolizumab in adenocarcinoma NSCLC and TNBC, respectively, based on 15% market penetration in the US and 10% in Europe. With approximately 40% of lung cancer cases being adenocarcinoma NSCLC and 70% of those stage III/IV, there are c 62,300 and c 87,700 new cases of unresectable, adenocarcinoma NSCLC per year in US and Europe, respectively. In breast cancer, about 15% of cases are classed as TNBC suggesting there are about 38,000 and 55,000 diagnosed with TNBC each year in the US and Europe, respectively. Clearly, if the data from the two studies are positive, we would expect the development programme in immuno-oncology to expand to other indications and checkpoint inhibitors. It is important to note that Merck has no rights to BGB324 from the collaboration, and that during the trials it is only supplying pembrolizumab and conducting the PD-L1 biomarker assays. BerGenBio is also exploring the potential of BGB324 to re-sensitise tumour cells to chemotherapy, through an investigator-led Phase II trial. As previously discussed, tumour cells change their characteristics during EMT and this can render them resistant to chemotherapy. The study in second-line NSCLC with docetaxel is being conducted by Dr David Gerber at the University of Texas Southwestern Medical Center and there are again promising initial results. In preclinical studies, BGB324 was shown to act synergistically with docetaxel in two different models (Exhibit 12). In both cases, it appears that BGB324 prevents the tumour cells from becoming resistant to docetaxel, as they tend to become after 10-15 days. The clinical study with BGB324 in combination with docetaxel is a Phase Ib dose-escalation study. The standard dose of docetaxel (75mg/m2 every three weeks) is being used initially with a loading dose of 200mg of BGB324 followed by a daily dose of 100mg, and then with the dose of BGB324 doubled, assuming the combination is sufficiently well tolerated. This will be followed by up to 30 more patients being treated with the best dosing regimen from the first stage of the trial. Initial data has only been published for the first ten patients from the trial, with BGB324 being used at the lower dose, and there is already evidence of BGB324 reducing tumour resistance to docetaxel (Exhibit 13). 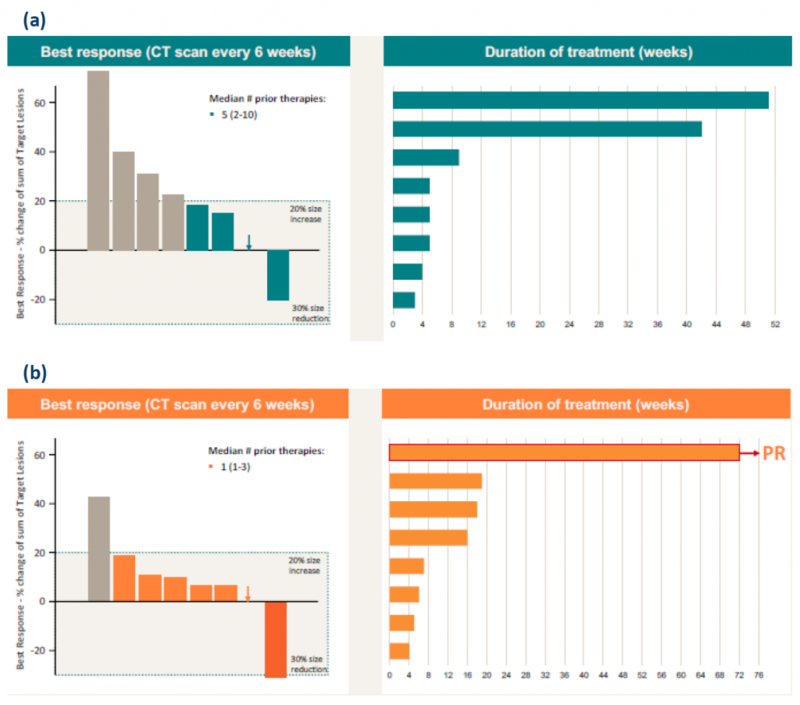 One patient has so far been treated for 34 weeks without progression, this compares to the median PFS of about 12 weeks in this indication with docetaxel monotherapy. Further data from this trial is expected at ASCO in June 2018. We forecast that BGB324 could achieve peak sales of $218m in second-line NSCLC in combination with docetaxel. Of the 184,000 new NSCLC cases per year in the US and 255,000 patients in Europe, around 30% receive chemotherapy and c 60% of those advance to second-line therapy. We estimate that 30% of those are treated with docetaxel so that there are about 33,000 patients treated with docetaxel in the US and 46,000 in Europe. At this stage, we estimate that BGB324’s market penetration will be 15% in the US and 10% in Europe. The market opportunity with docetaxel in second-line NSCLC is relatively modest. However, if there is impressive data from this Phase Ib trial, the potential of BGB324 in combination with other chemotherapy regimens could be explored in other indications. This would significantly increase the peak sales potential of BGB324 in combination with chemotherapy. The final study with BGB324 is a Phase Ib, investigator-led study in metastatic melanoma in combination with pembrolizumab, or dabrafenib (Raf inhibitor) and trametinib (Mek inhibitor). This is a real-world study in 92 patients and as such could provide the most valuable data. The study is being conducted by Haukeland University Hospital, with patients being treated across Norway in Bergen, Oslo, Tromso and Trondheim (an additional site at Lorenskog is due to open). During the trial, patients are allocated to different arms according to their BRAF status, and it also has a cross over design as illustrated in Exhibit 14. Initial data from thirteen patients have so far been reported (Exhibit 15) and no significant additive toxicity has been observed from the use of BGB324 in combination with dabrafenib/trametinib or pembrolizumab. Further interim data is expected to be published at ASCO in June 2018. The treatment of metastatic melanoma has been transformed in recent years with the approval of Raf and Mek inhibitors and immunotherapies. But, there are limitations of both therapies; median PFS for dabrafenib/trametinib in the Phase III COMBI-d trial was only 9.3 months and the overall response rate to pembrolizumab was 33% and 34% (two dosing arms) in the Phase III KEYNOTE-006 trial. 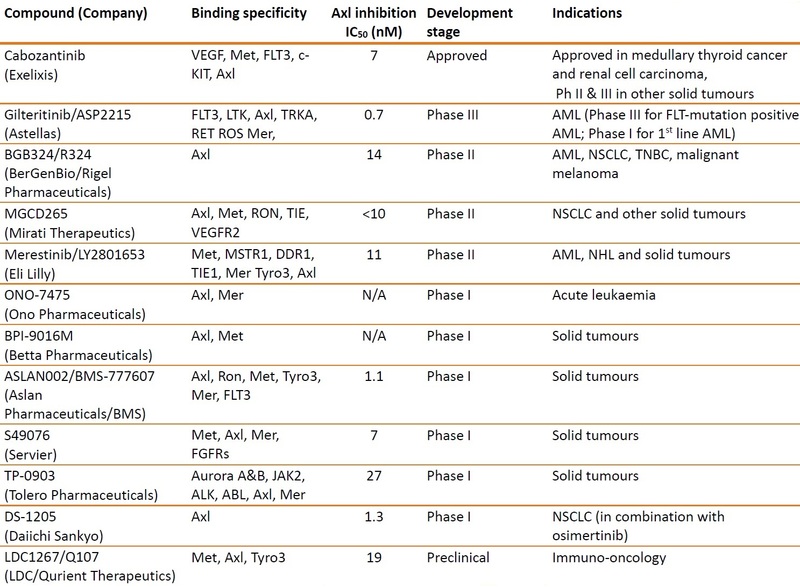 Axl signalling has been implicated with both resistance to Raf and Mek inhibitors, as well as enhancing immunotherapies (as discussed above), hence the belief that BGB324 will improve the clinical outcomes in combination with both therapeutic regimens for melanoma. We estimate that BGB324 could achieve peak sales of $200m in metastatic melanoma, by penetrating 15% of the US market and 10% of the European. There are about 9,700 deaths in the US and 15,700 in Europe from melanoma. BerGenBio was initially focused on developing a monoclonal antibody against Axl, but opportunistically decided to in-license various selective Axl inhibitors from Rigel in June 2011 in a backend weighted deal, once it became aware of them. Since then, BerGenBio has prioritised the development of the small molecule BGB324, which was R324. Under the terms of the deal, BerGenBio obtained the worldwide exclusive rights to BGB324 and eight back-up compounds with the right to sub-license the assets (and subsequently, it exercised its option to in-license nine other Axl inhibitors from Rigel for $2m in June 2016). In exchange, BerGenBio agreed to make various payments to Rigel; it has so far paid: time-based payments of $0.5m in 2011 and 2012, a similar payment of $1.7m in 2016, and $3.3m in February 2017 relating to the initiation of first Phase II study for the first product. In the future, payments will depend on whether the product is developed/commercialised in house or by a partner. $15m milestone for approval of first drug. If BerGenBio out-licenses BGB324, payments based on a revenue sharing model will need to be made to Rigel according to the schedule below. 30% after completion of a Phase III study. BerGenBio is considering whether to partner BGB324. The final decision will depend on the clinical data; however, we believe that it is most likely that BerGenBio will look to partner BGB324 with a large player on completion of the current programme of Phase II studies. Assuming data from the trials confirm BGB324’s potential to treat a broad range of tumours and in combination with various other regimens (targeted therapy, immuno-oncology, and chemotherapy), considerable resources would be required to conduct a broad Phase III oncology programme. This would be necessary to maximise the value of BGB324. Both the Phase Ib/II trials in AML and with erlotinib are expected to recruit over 60 patients. We therefore believe that in the event that BerGenBio enters into a sub-licensing agreement, it will pay 35% of revenue receipts to Rigel. The main risk with BerGenBio at the moment relates to the outcome of the clinical trials. The initial results are promising, but the true potential of BGB324 will only become apparent at the end of the current Phase II studies. The broad programme, combined with the biomarker analysis, partially de-risks the company, but it should be recognised that BerGenBio is developing a first-in-class product, and the biology of Axl is particularly complex and only partly understood. It should also be noted that BGB324 might also have a greater effect on overall survival (OS) than progression free survival (PFS), because of BGB324’s effect on the immune system and tumour metastasis. The company is yet to decide whether to take BGB324 to market by itself or with a partial/full out-licensing of BGB324. The novelty of the compound, while making the development process more challenging, means that it is likely to be commercially attractive to prospective partners, especially as it has such broad potential as an oncology therapy (assuming the current trials are successful). Should BerGenBio look to partner BGB324, it is important to realise that the best deal might not be the one with the greatest bio-dollars, but the one with the most committed partner that will devote sufficient resources to optimise the product’s development. BGB324 is currently being developed for AML/MDS, NSCLC, TNBC and metastatic melanoma in various settings (monotherapy, with targeted therapies, with chemotherapy and with the checkpoint inhibitor pembrolizumab). The results of the Phase II studies will determine if the programme is expanded or contracted. This decision will be based on both scientific and commercial considerations. The potential of BGB324 as an immuno-oncology therapy agent is particularly exciting, however, this field is highly competitive. Although BGB324 is currently the only selective Axl inhibitor in development, there will probably be more entering the clinic now that the important role that Axl plays in EMT, chemotherapy resistance and immuno-oncology is better understood. Clearly, the rate at which BerGenBio can advance BGB324 will determine the first-mover advantage for the compound, should it reach the market. On top of these specific risks, there are also the other usual ones associated with drug development, including patent litigation, financing and regulatory uncertainties. Regarding its patent position, the composition of matter patent (PCT/US07/089177) is due to lapse in 2027 without an extension, and there is a patent pending covering the use of BGB324 (PCT/GB2014/053548), which should protect the compound from competition through to 2034. There are also various other patents (awarded and pending), which could provide a degree of protection through to 2036. With BerGenBio being a classic drug development company, it is well-suited to being valued using a rNPV methodology. Typically, the rNPV of the individual clinical projects (adjusted for the success probabilities) are summed and netted against the costs of running the operation. In the case of BerGenBio, we estimate the value of BGB324 in each indication in which it is currently being developed. The success probabilities in each indication are based on standard industry criteria for each stage of the clinical development process but are flexed to reflect the data from the different indications. Using this approach, we value BerGenBio at NOK1,564m ($184m), which is equivalent to NOK31.34/share; the details of our valuation are shown in Exhibit 14. The valuation is based on cash flows through to 2034, when we estimate that BGB324 will lose patent protection. Throughout the valuation we have used conservative assumptions, in line with our policy. For example, we do not assume meaningful revenues from BGB324 before 2023, and exclude any value from BGB324 in any indications beyond those currently being investigated, or from the rest of its portfolio. Being prudent, we have assumed the average cost of treatment across all indications will be $80,000 in the US and two thirds the price in Europe. This compares to an estimated average cost of treating a patient with AstraZeneca’s osimertinib (Tagrisso) of $200,000 and Merck’s pembrolizumab (Keytruda) of $150,000. We believe this is sensible given the limited clinical data. Also, BGB324 has the potential to be used to treat most solid tumours, either in combination with chemotherapy or immuno-oncotherapies, and has very low cost of goods, so a relatively low price might be settled upon to ensure that reimbursement issues do not hinder adoption of BGB324. 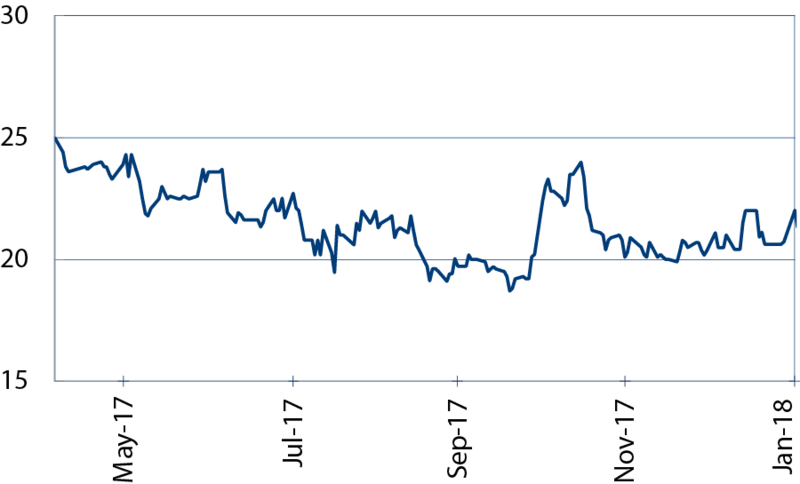 The shares are currently trading at 47% below our valuation of BerGenBio, we expect this difference to be reduced over the coming year as data is regularly reported from the six Phase II trials. Four of the clinical trials are also expected to report final ORR and PFS data by the end of 2018, as well as interim results from the other studies, which could result in significant increases to our valuation. Source: Trinity Delta. Note: Valuation assumes BGB324 is out-licensed in 2019. The value of each indication includes the current R&D expenses associated with the current clinical trials. 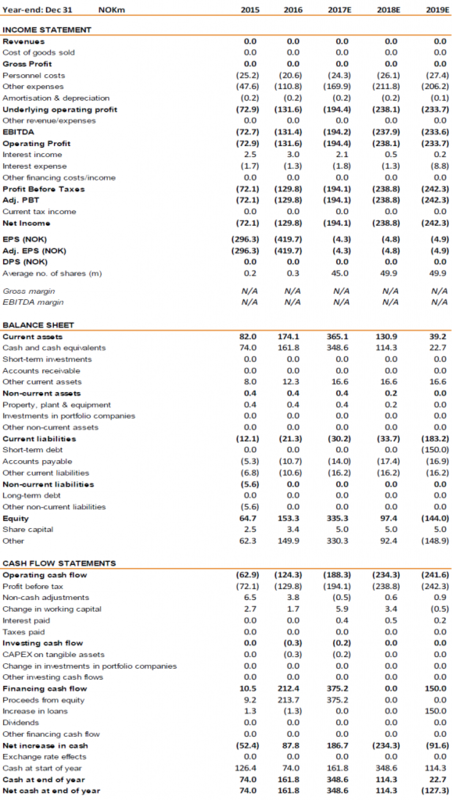 BerGenBio had a cash position of NOK399m (c $47m) in cash and no debt at Q317, reflecting the successful IPO. The company raised NOK375m net (NOK400m gross), after issuing 16m shares at NOK25 per share on 6 April, ahead of the shares starting to trade the following day on the Oslo Stock Exchange. We estimate that this will allow the company to operate into H119, by which time it should have reported ORR data from the trials in AML (monotherapy), NSCLC with erlotinib, NSCLC with pembrolizumab and TNBC with pembrolizumab, as well as interim data from the other studies. The operating costs have increased rapidly in recent years due to BGB324 starting clinical development and the subsequent expansion in the number and size of clinical studies. They were NOK58.8m in FY14, NOK72.9 in FY15 and NOK131.6m (including payments of NOK31.1m to Rigel) in FY16. We expect this trend to continue with operating costs of NOK194.4m (including a milestone payment of NOK27.9m to Rigel) in FY17 and NOK238.1m in FY18. We currently expect the operating expenses to fall slightly in FY19 to NOK233.7m, though this could vary significantly depending on the outcome of the current clinical trials and whether BerGenBio decides to take BGB324 into Phase III development. Phagocytosis is the process through which cellular debris from apoptotic cells and microorganisms are ingested by phagocytes, such as macrophages and neutrophils. Type 2 immune responses are generated following infection from helminths (parasitic worms) and exposure to allergens. Triple negative breast cancer (TNBC) does not express oestrogen receptor, progesterone receptor or HER2 receptor, which means that there are limited treatment options for TNBC patients other than chemotherapy. Stein Holst Annexstad Non-Executive Chairman Joined in February 2016 He has senior industry experience, both at executive and Board levels. He is former executive of Dyno Industrier AS (fine chemicals), and became the CEO of the pharmaceutical firm Nycomed AS (subsequently merged with Amersham Plc and thereafter merged with GE). He was head of AS Isco Group, an Executive Search and Corporate Advisory Group. He co-founded in 1996 NorgesInvestor AS, an Oslo-based Private Equity firm, and was in 2008 the first Chairman of Investinor AS (the VC of the Norwegian State). He was Chairman of Algeta ASA, the pharmaceutical startup that developed Xofigo and was acquired by Bayer in 2014. Other previous Chairman positions comprise commercial banking, business school, public R&D and various industrial enterprises. Richard Godfrey CEO Joined as Chief Executive Officer in 2008. He has over 25 years’ industry experience in drug development and commercialisation. Previously, he served as CEO of Aenova Inc., a specialist biopharmaceutical company and prior to that was the Managing Director of DCC Healthcare Ltd. He also held positions at Catalant, Eli Lilly and Reckitt Benckiser in R&D and commercial roles. He qualified as a Pharmacist from Liverpool University and received his M.B.A. from Bath University. Petter Nielsen CFO Joined in 2015 as CFO. He was previously CFO at GexCon, an R&D company that developed into an international group of companies focusing on commercial products and services. Prior to that he worked in the Transaction Advisory Services group at Ernst & Young. He has an MSc in Auditing and an MSc in Economics and Business Administration, both from the Norwegian School of Economics. Prof James Lorens CSO Co-founder and CSO of BerGenBio, and also a Professor at the Department of Biomedicine at the University of Bergen. He leads a large internationally active academic research laboratory comprising 22 researchers, that is focused on cancer research. Prof. Lorens is an author of more than 85 peer-reviewed articles and numerous patents. He worked at Rigel after completing his postdoctoral studies at Stanford University and has managed many large collaborations with major pharmaceutical and biotechnology companies. Dr Murray Yule Clinical Development Officer Joined in 2011. Since 1998 has been involved with oncology clinical development, he has supervised multiple early phase clinical studies, and planned and executed global development strategies for several anticancer drugs for top-ten pharmaceutical companies. His work has led to licensing approvals for novel tubulin binders in solid tumours and epigenetic therapies in acute leukaemia. He completed his medical training in oncology at Addenbrookes Hospital, Cambridge and holds a PhD in experimental pharmacology.